The United States Congress designated the Breton Wilderness (map) in 1975 and it now has a total of 5,000 acres. All of this wilderness is located in Louisiana and is managed by the Fish and Wildlife Service. Located off the delta of the great Mississippi River, Breton Island actually consists of two adjacent islands (north and south) with a combined length of about three miles and a width of less than one mile. 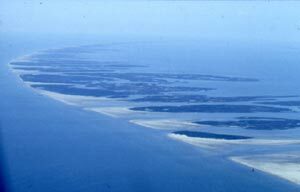 Part of a long chain of barrier islands, they comprise only a small section of Breton National Wildlife Refuge. The greater portion of the refuge consists of the Chandeleur Islands, an approximately 20-mile-long crescent of land lying north of Breton. Between Breton and Chandeleur are more islands owned by the state and managed by the refuge. Geologically young, these unstable islands were created by the erosion and reshaping of a former Mississippi River delta. On the Gulf of Mexico side of the islands you'll find low sandy beaches tapering into a maze of ponds, inlets, and saltwater marshes. Hundreds of thousands of seabirds use these islands as nesting and wintering habitat. Approximately five percent of the islands are used by nesting birds. Endangered brown pelicans have made a dramatic return under careful refuge management. Human visitors are common, sometimes coming for bird watching but primarily for surf fishing. Planning to Visit the Breton Wilderness? How to follow the seven standard Leave No Trace principles differs in different parts of the country (desert vs. Rocky Mountains). Click on any of the principles listed below to learn more about how they apply in the Breton Wilderness.